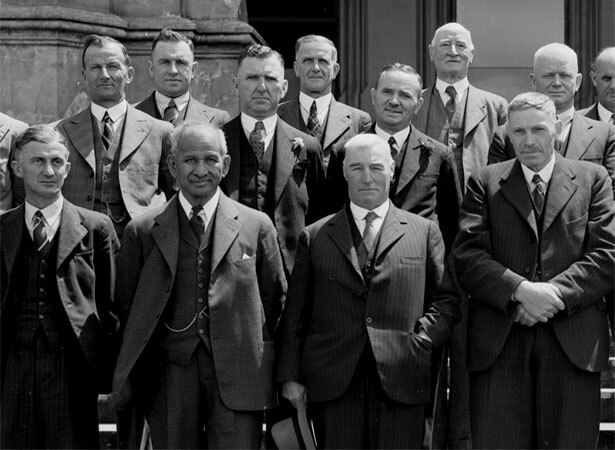 Following their crushing defeat by the Labour Party in the 1935 general election, the remnants of the United–Reform coalition government met in Wellington on 13–14 May 1936 to establish a new ‘anti-socialist’ party. The conference in the Dominion Farmers’ Institute Building was attended by 11 members of the Dominion Executive of the National Political Federation (the body that had run United–Reform’s 1935 campaign), 232 delegates from around the country, representatives of women’s and youth organisations, and most of the re-elected anti-Labour MPs. The party was named the New Zealand National Party to signal a clean break with United and Reform, which had been discredited by their handling of the Depression. Adam Hamilton was elected as its first leader in October 1936. The National Party grew quickly and by the time of its third annual conference in August 1938 it boasted more than 100,000 members. Even so, it would take a further 11 years for the party to win office for the first time. We have 8 biographies, 1 article, related to National Party founded.